Puppet maker Mirek Trejtnar clip-clopped a red-nosed marionette across a makeshift plywood stage in his studio in Prague. This, he told me, was Kasparek, perhaps the most iconic character in Czech puppetry: a source of comic relief beloved by children countrywide. Kasparek was a mesmerizing, expressive chap, particularly for being made of wood and having no movable parts of his face. He danced a jig; he tripped and dragged himself, moaning, across the stage; he banged his head on the ground. I had come to the Puppets in Prague studio that Trejtnar shares with his wife, Leah Gaffen, through a recommendation from a friend in the arts scene in Cincinnati. Before meeting them, though, I had felt a lot like Kasparek: banging my head against a wall of tourists. Of which, of course, I was one, along with my friend Julia, who had come to visit. For decades, Prague has been on the backpacker circuit, and for good reason: It is magnificent. Every building in the UNESCO-inscribed medieval city center will set your mouth agape. But as Julia and I navigated through our first few days, I kept wondering when we were going to scrape past the crowds (there were a record 7.65 million visitors in 2017) to reach the scrappy, resilient spirit of the city that had so charmed me a decade ago. Under Austrian rule, Trejtnar explained, all official theater in big cities was performed in German. The only outlet for Czech people to see culture in their native language came from families who traveled in caravans performing puppet shows. "The message of these puppeteers was kept by writers and poets, and when there was a national uprising, they had the aura of national heroes because they had carried the language around," he said. "For puppetry, 1918 was very important." Set in a Baroque aristocratic summerhouse from the 1720s, Portheimka is a branch of Prague's modern art gallery, Kampa Museum. It is also a beautiful and restful place to spend an afternoon. The art is displayed beneath ceilings painted with religious murals, or in colorful, centuries-old marble alcoves. One prism-like disk stood in a window like a lens, fracturing views of the garden hedges below. What moved me most was seeing the exquisite works of little-known Czech glass artists from the 1960s given a place of reverence befitting such a unique tradition. Afterward we walked around Smichov's quiet streets, exchanging hellos with the few residents out walking their dogs. At times, though, the crowds did overwhelm — and so Julia and I adopted the philosophy of stopping right there and getting a beer. It felt like an appropriate approach: Light beers are only 4 percent alcohol, and it is common to see 70-year-old Prague women having one over breakfast. Luckily, a bartender we had met on our first night at O'Che's Bar in the city center, directed us to two terrific microbreweries. At U Medvidku, founded in 1466, we tasted what they claim is the strongest beer in the world, uniquely fermented in open wooden barrels and sold nowhere else in the city, let alone the world. (We liked their other beers better.) A trip to Klasterni Pivovar Strahov (monastic brewery), high on a hill near the Prague Castle, came with similarly great beers, plus a night view of the city and an accordion player who inspired a conga line. Our favorite spot was Riegrovy Sady, a beer garden in the Vinohrady neighborhood where students can afford to live. They served local microbrews for around $2, instead of the commercial stuff we had sometimes paid $4 for in the city center. I liked being there so much that I came back on my own one evening after Julia left. Just down the road, at least 100 people were gathered on picnic blankets on a hillside to watch the most spectacular iteration of all the sunsets and sunrises I saw in Prague. The guy on acoustic guitar and groups of friends playing badminton — all drinking to-go beers — made it that much more special. › Food: I ate goulash for nearly every meal. Julia used the app Happy Cow to find vegan gems, like Vegan’s Prague with a rooftop view of Prague Castle. 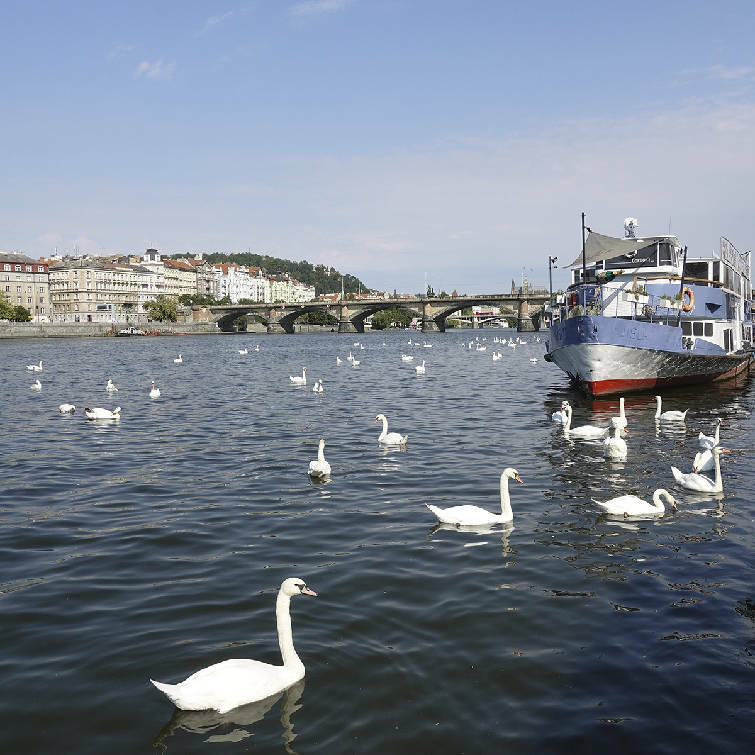 But my top recommendation was the Saturday morning Naplavka Farmers Market right on the Vltava River. Weeknights, Naplavka turns into a great spot to get a beer and see a Czech rock band play on a boat. › Lodging: We stayed in the city center, but if I returned, I would get a place in the Smichov, Karlin, Vinohrady or Vrosvice neighborhoods: close to the action, but with the pace and elegant architecture of the more residential parts of Paris. › Timing: As much as I am not a morning person, it’s clear: Prague in summer is best experienced at dawn and dusk, just as a city resident with a day job might. I got in the habit of chasing sunrises (best: Charles Bridge, the Metronome) and sunsets (Vysehrad Fortress, Riegrovy Sady beer garden). Getting up early gave us the grounds of Prague Castle, which open at 6 a.m., all to ourselves. › Transit: Beware the airport taxi scam. I paid nearly twice as much to get to my hotel as I should have, according to signs all over the city center from the mayor of Prague that said the maximum price for an airport taxi should be 550 koruna, about $25. Locals, meanwhile, told me it should be more like 300 ($14). Prague’s tram and subway systems are excellent and cheap, but if you must take a car, your best bet is the Czech-based app Liftago. The couple of times I used Uber, the drivers made me pay in cash. Or follow Edita’s brilliant strategy for walking around the city center like a native: Know the direction you are going and when you see people, divert to a parallel side street.